Martinique ([maʁtinik]) is an insular region of France located in the Lesser Antilles in the eastern Caribbean Sea, with a land area of 1,128 square kilometres (436 sq mi) and a population of 385,551 inhabitants as of January 2013. Like Guadeloupe, it is an overseas region of France, consisting of a single overseas department. One of the Windward Islands, it is directly north of Saint Lucia, southeast of Puerto Rico, northwest of Barbados, and south of Dominica. As with the other overseas departments, Martinique is one of the eighteen regions of France (being an overseas region) and an integral part of the République française (French Republic). As part of France, Martinique is part of the European Union, and its currency is the euro. The official language is French, and virtually the entire population also speaks Antillean Creole (Créole Martiniquais). When Columbus returned to the island in 1502, he rechristened the island as Martinica. The name then evolved into Madinina ("Island of Flowers"), Madiana, and Matinite. 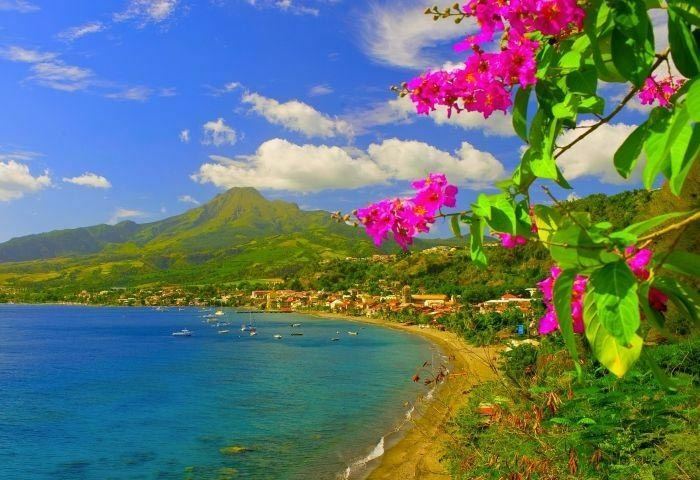 Finally, through the influence of the neighboring island of Dominica (La Dominique), it came to be known as Martinique. The island was occupied first by Arawaks, then by Caribs. The Carib people had migrated from the mainland to the islands about 1201 CE, according to carbon dating of artifacts. They were largely displaced, exterminated and assimilated by the Taino, who were resident on the island in the 1490s. Martinique was charted by Columbus in 1493, but Spain had little interest in the territory. On 15 September 1635, Pierre Belain d'Esnambuc, French governor of the island of St. Kitts, landed in the harbor of St. Pierre with 150 French settlers after being driven off St. Kitts by the English. D'Esnambuc claimed Martinique for the French King Louis XIII and the French "Compagnie des Îles de l'Amérique" (Company of the American Islands), and established the first European settlement at Fort Saint-Pierre (now St. Pierre). D'Esnambuc died in 1636, leaving the company and Martinique in the hands of his nephew, Jacques Dyel du Parquet, who in 1637, became governor of the island. In 1636, the indigenous Caribs rose against the settlers to drive them off the island in the first of many skirmishes. The French successfully repelled the natives and forced them to retreat to the eastern part of the island, on the Caravelle Peninsula in the region then known as the Capesterre. When the Carib revolted against French rule in 1658, the Governor Charles Houël du Petit Pré retaliated with war against them. Many were killed; those who survived were taken captive and expelled from the island. Some Carib had fled to Dominica or St. Vincent, where the French agreed to leave them at peace. Because there were few Catholic priests in the French Antilles, many of the earliest French settlers were Huguenots who sought greater religious freedom than what they could experience in mainland France. They were quite industrious and became quite prosperous. Although edicts from King Louis XIV's court regularly came to the islands to suppress the Protestant "heretics", these were mostly ignored by island authorities until Louis XIV's Edict of Revocation in 1685. From September 1686 to early 1688, the French crown used Martinique as a threat and a dumping ground for mainland Huguenots who refused to reconvert to Catholicism. Over 1,000 Huguenots were transported to Martinique during this period, usually under miserable and crowded ship conditions that caused many of them to die en route. Those that survived the trip were distributed to the island planters as Engagés (Indentured servants) under the system of serf peonage that prevailed in the French Antilles at the time. As many of the planters on Martinique were themselves Huguenot, and who were sharing in the suffering under the harsh strictures of the Revocation, they began plotting to emigrate from Martinique with many of their recently arrived brethren. Many of them were encouraged by their Catholic brethren who looked forward to the departure of the heretics and seizing their property for themselves. By 1688, nearly all of Martinique's French Protestant population had escaped to the British American colonies or Protestant countries back home. The policy decimated the population of Martinique and the rest of the French Antilles and set back their colonization by decades, causing the French king to relax his policies in the islands yet leaving the islands susceptible to British occupation over the next century. Martinique was occupied several times by the British including once during the Seven Years' War and twice during the Napoleonic Wars. Britain controlled the island almost continuously from 1794–1815, when it was traded back to France at the conclusion of the Napoleonic Wars. Martinique has remained a French possession since then. As sugar prices declined in the early 1800s, the planter class lost political influence. In 1848, Victor Schoelcher persuaded the French government to end slavery in the French West Indies. On 8 May 1902, Mont Pelée erupted and completely destroyed St. Pierre, killing 30,000 people. Due to the eruption refugees from Martinique arrived in boats to the southern villages of Dominica with some remaining permanently on the island. In Martinique the only survivor in the town of Saint-Pierre, Auguste Cyparis, was saved by the thick walls of his prison cell. Shortly thereafter the capital shifted to Fort-de-France, where it remains today. In 1946, the French National Assembly voted unanimously to transform the colony into an Overseas Department of France. In 1974, it became simply a Department. In 2009, the French Caribbean general strikes exposed deep ethnic, and class tensions and disparities within Martinique. Together with Guadeloupe, La Réunion, Mayotte and French Guiana, Martinique is one of the Overseas Departments of France. It is also an outermost region of the European Union. The inhabitants of Martinique are French citizens with full political and legal rights. Martinique sends four deputies to the French National Assembly and two senators to the French Senate. January 24, 2010, during a referendum, the Inhabitants of Martinique approved in 68.4% the passage in a " unique(only) community ", within the framework of the article 73 of the Constitution, this one replaces and exercises the skills of the General Council and the regional council. Fort-de-France is the sole prefecture of Martinique. It takes up the central zone of the island. It includes four communes and sixteen cantons. In 2013 the population was 161,021. Besides the capital, it includes the communities of Saint-Joseph and Schœlcher. La Trinité is one of the three subprefectures on the island and occupies the northeast region. It has ten communes and eleven cantons. In 2013 the population was 81,475. La Trinité contains the communities of La Trinité, Ajoupa-Bouillon, Basse-Pointe, Le Gros-Morne, Le Lorrain, Macouba, Le Marigot, Le Robert and Sainte-Marie. Le Marin, the second subprefecture of Martinique, makes up the southern part of the island and is composed of twelve communes and thirteen cantons. In 2013 the population was 119,653. The subprefecture includes the communities of La Marin, Les Anses d'Arlet, Le Diamant, Ducos, Le François, Rivière-Pilote, Rivière-Salée, Sainte-Anne, Sainte-Luce, Saint-Esprit, Les Trois-Îlets and Le Vauclin. Saint-Pierre is the third subprefecture of the island. It comprises eight communes and five cantons, lying in the northwest of Martinique. In 2013 the population was 23,402. Together with Saint-Pierre, its communities include Le Carbet, Case-Pilote-Bellefontaine, Le Morne-Rouge and Le Prêcheur. Part of the archipelago of the Antilles, Martinique is located in the Caribbean Sea about 450 km (280 mi) northeast of the coast of South America and about 700 km (435 mi) southeast of the Dominican Republic. It is directly north of St. Lucia, northwest of Barbados, southeast of both are Puerto Rico and Dominican Republic and south of Dominica. The total area of Martinique is 1,100 square kilometres (420 sq mi), of which 40 square kilometres (15 sq mi) is water and the rest land. Martinique is the 3rd largest island in The Lesser Antilles after Trinidad and Guadeloupe. It stretches 70 km (43 mi) in length and 30 km (19 mi) in width. The highest point is the volcano of Mont Pelée at 1,397 metres (4,583 ft) above sea level. The island is volcanic in origin, lying along the subduction fault where the South American Plate slides beneath the Caribbean Plate. Martinique has eight different centers of volcanic activity. The oldest rocks are andesitic lavas dated to about 24 million years ago, mixed with tholeiitic magma containing iron and magnesium. Mont Pelée, the island's most dramatic feature, formed about 400,000 years ago. Pelée erupted in 1792, 1851, and twice in 1902. The eruption of 8 May 1902, destroyed Saint-Pierre and killed 28,000 people in 2 minutes; that of 30 August 1902 caused nearly 1,100 deaths, mostly in Morne-Red and Ajoupa-Bouillon. The Atlantic, or "windward" coast of Martinique is difficult for the navigation of ships. A combination of coastal cliffs, shallow coral reefs and cays, and strong winds make the area a notoriously hazardous zone for sea traffic. The peninsula of Caravelle clearly separates the north Atlantic and south Atlantic coast. The Caribbean, or "leeward" coast of Martinique is much more favorable to sea traffic. In addition to being shielded from the harsh Atlantic trade winds by the island, it also descends steeply from the shore. This ensures most potential hazards are too deep underwater to be an issue and also prevents the growth of corals that could otherwise pose a threat to passing ships. The north of the island is mountainous. It features four ensembles of pitons (volcanoes) and mornes (mountains): the Piton Conil on the extreme North, which dominates the Dominica Channel; Mont Pelée, an active volcano; the Morne Jacob; and the Pitons du Carbet, an ensemble of five extinct volcanoes covered with rainforest and dominating the Bay of Fort de France at 1,196 metres (3,924 ft). Mont Pelée's volcanic ash has created gray and black sand beaches in the north (in particular between Anse Ceron and Anse des Gallets), contrasting markedly from the white sands of Les Salines in the south. The south is more easily traversed, though it still features some impressive geographic features. Because it is easier to travel and because of the many beaches and food facilities throughout this region, the south receives the bulk of the tourist traffic. The beaches from Pointe de Bout, through Diamant (which features right off the coast of Roche de Diamant), St. Luce, the department of St. Anne and down to Les Salines are popular. The northern end of the island catches most of the rainfall and is heavily forested, featuring species such as bamboo, mahogany, rosewood and locust. The south is drier and dominated by savanna-like brush, including cacti, Copaiba balsam, logwood and acacia. Anolis lizards and fer-de-lance snakes are native to the island. Mongooses (Herpestes auropunctatus), introduced in the 1800s to control the snake population, have become a particularly cumbersome introduced species as they prey upon bird eggs and have exterminated or endangered a number of native birds, including the Martinique trembler, white-breasted trembler and white-breasted thrasher. In 2003, Martinique had a total GDP of 5.496 billion euros. In 2000 its per capita GDP was 14,283 euros. In that year services constituted 82.2% of GDP, while industry represented 8.6% and agriculture 3.5%. 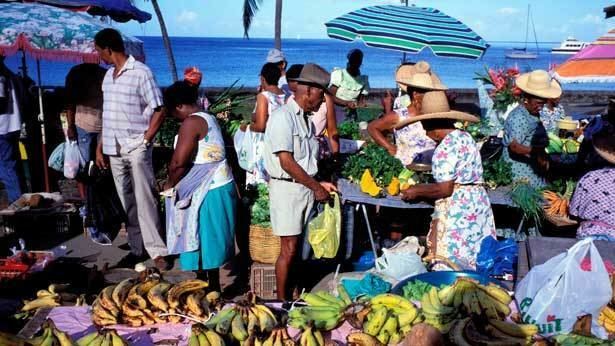 In 2002, the island exported 26 million euros-worth of goods, primarily fruit, beverages and refined petroleum products. It imported 486 million euros-worth of goods, including vehicles, furniture, medicine and raw petroleum (used in the island's refinery). Historically, Martinique's economy relied on agriculture, but by the beginning of the 21st century this sector had dwindled considerably. Sugar production has declined, with most of the sugarcane now used for the production of rum. Banana exports are increasing, going mostly to mainland France. The bulk of meat, vegetable and grain requirements must be imported. This contributes to a chronic trade deficit that requires large annual transfers of aid from mainland France. All goods entering Martinique are charged a variable "sea toll" which may reach 30% of the value of the cargo and provides 40% of the island's total revenue. Additionally the government charges an "annual due" of 1–2.5% and a value added tax of 2.2–8.5%. Tourism has become more important than agricultural exports as a source of foreign exchange. In 2000, the island hosted 500,000 tourists, and the tourism industry employed 7% of the total workforce. Roughly 16% of the total businesses on the island (some 6,000 companies) provide tourist-related services. Martinique's main and only airport with commercial flights is Martinique Aimé Césaire International Airport. It serves flights to and from Europe, the Caribbean, Venezuela, the United States, and Canada. See List of airports in Martinique. Fort-de-France is the major harbor. The island has regular ferry service to Guadeloupe, Dominica, St. Lucia, Les Saintes and Marie Galante. There are also several local ferry companies that connect Fort-de-France with Pointe du Bout. The road network is extensive and well-maintained, with freeways in the area around Fort-de-France. Buses run frequently between the capital and St. Pierre. The country code top-level domain for Martinique is .mq, but .fr is often used instead. The entire island uses a single area code (596) for landline phones and 696 for cell phones. Martinique had a population of 385,551 as of January 2013. There are an estimated 260,000 people of Martinican origin living in mainland France, most of them in the Paris region. Emigration was highest in the 1970s, causing population growth to almost stop, but it is comparatively light today. The population of Martinique is mainly of Africans generally mixed with some French, Amerindian (Carib), Indo-Martiniquais (of Tamil origin), Lebanese or Chinese ancestry. Martinique also has a small Syro-Lebanese community, a small but increasing Chinese community, and the Béké community, descendants of European ethnic groups of the first French and Spanish settlers, who still dominate parts of the agricultural and trade sectors of the economy. Whites in total represent 5% of the population. The Béké population (which totals around 1% of Martinique's population, most of them being of aristocratic origin by birth or after buying the title) generally live in mansions on the Atlantic coast of the island (mostly in the François - Cap Est district). In addition to the island population, the island hosts a metropolitan French community, most of which lives on the island on a temporary basis (generally from 3 to 5 years). The official language is French, which is spoken by virtually the entire population. In addition, most residents can also speak Martiniquan Creole, a form of Antillean Creole closely related to the varieties spoken in neighboring English-speaking islands of Saint Lucia and Dominica. Martiniquan Creole is based on French, Carib and African languages with elements of English, Spanish, and Portuguese. It continues to be used in oral storytelling traditions and other forms of speech and to a lesser extent in writing. Use of Creole is predominant among friends and close family. Though it is normally not used in professional situations, members of the media and politicians have begun to use it more frequently as a way to redeem national identity and prevent cultural assimilation by mainland France. Indeed, unlike other varieties of French creole such as Mauritian Creole, Martinican Creole is not readily understood by speakers of Standard French due to significant differences in grammar, syntax, vocabulary and pronunciation, though over the years it has progressively adapted features of Standard French. An estimated 90% of residents are Roman Catholic; 5% are Hindu and another 5% practice other faiths, including Protestantism, African belief systems, Judaism, or are non-religious. As an overseas département of France, Martinique's culture blends French and Caribbean influences. The city of Saint-Pierre (destroyed by a volcanic eruption of Mount Pelée), was often referred to as the "Paris of the Lesser Antilles". Following traditional French custom, many businesses close at midday to allow a lengthy lunch, then reopen later in the afternoon. Today, Martinique has a higher standard of living than most other Caribbean countries. French products are easily available, from Chanel fashions to Limoges porcelain. Studying in the métropole (mainland France, especially Paris) is common for young adults. Martinique has been a vacation hotspot for many years, attracting both upper-class French and more budget-conscious travelers. Martinique has a hybrid cuisine, mixing elements of African, French, Carib Amerindian and South Asian traditions. One of its most famous dishes is the Colombo (compare Tamil word kuzhambu for gravy or broth), a unique curry of chicken (curry chicken), meat or fish with vegetables, spiced with a distinctive masala of Tamil origins, sparked with tamarind, and often containing wine, coconut milk, cassava and rum. A strong tradition of Martiniquan desserts and cakes incorporate pineapple, rum, and a wide range of local ingredients. Martinique has a large popular music industry, which gained in international renown after the success of zouk music in the later 20th century. Zouk's popularity was particularly intense in France, where the genre became an important symbol of identity for Martinique and Guadeloupe. Zouk's origins are in the folk music of Martinique and Guadeloupe, especially Martinican chouval bwa, and Guadeloupan gwo ka. There's also notable influence of the pan-Caribbean calypso tradition and Haitian kompa. 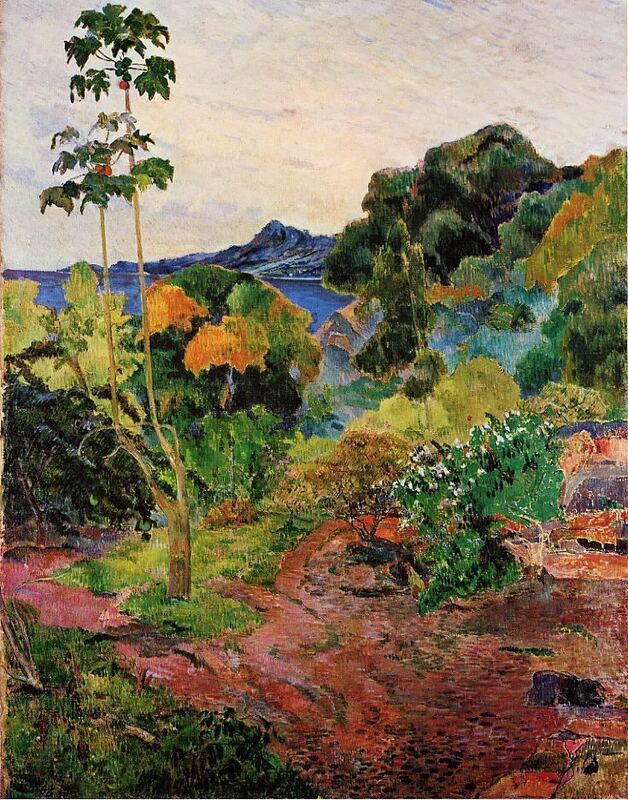 In 1887, the artist Paul Gauguin lived in Martinique. Gauguin painted the tropical landscape and the native women. The Paul Gauguin Interpretation Centre (former Gauguin Museum) is dedicated to his stay on the island. Martinique is the main setting of the 1944 film To Have and Have Not starring Humphrey Bogart and Lauren Bacall. Mexican writer Caridad Bravo Adams wrote Corazon Salvaje (published in 1957), which was set in Martinique. Martinique was featured in the 1999 remake of The Thomas Crown Affair, and in the movie Sugar Cane Alley (1983). Much of the 1979 Italian thriller Concorde Affaire '79 took place on and around the island. In Assassin's Creed III, Benjamin Church was trying to escape from Boston to get away from Haytham Kenway and Ratonhnhaké: ton until they caught him in Martinique. Martinique is the main setting of Patrick Chamoiseau's novel Solibo Magnificent. Martinique is referenced frequently in Jean Rhys' novel Wide Sargasso Sea (1966) as the previous home of the protagonist's mother and caretaker. Aimé Césaire's seminal poem, Cahier d'un retour au pays natal (Notebook of a Return to the Native Land), envisions the poet's imagined journey back to his homeland Martinique to find it in a state of colossal poverty and psychological inferiority due to the French colonial presence. Lafcadio Hearn in 1890 published an extraordinary travel book titled Two Years in the French West Indies, in which Martinique [Martinique Sketches] is its main topic; his descriptions of the island, people and history are lively observations of life before the Mont Pelèe eruption in 1902 that would change the island forever. The Library of America republished his works in 2009 entitled Hearn: American Writings. The Island: Martinique by John Edgar Wideman is a travel memoir of a black man visiting "a place built on slavery" and a "deeply personal journal of his romance with a Frenchwoman" (2003, National Geographic Society). Alya Césaire from Miraculous Ladybug is from Martinique. Martinique Island by Rex Bestle. Based on the volcanic eruption of Mount Pelee on May 8th 1902, killing 30,000 people and destroying the town of St. Pierre. Martinique on the Gulf is a small beach house resort in Gulf Shores, Alabama. Its architecture reflects that of the islands.